grace: – and we could at any moment have declared with holy fortitude our unalterable purpose to unfurl the Redeemer’s banner in the Mission field. ten AM we must be on board our ship. missionaries: – Mr  & Mrs Woolley & 2 children were returning to the scene of their former labors, and Mr & Mrs Rathbone were going out to the same island to which we were appointed. “All weight in this, & let me live to thee”! The tender father, and the gen’rous friend. On a fine spring day near the end of March, in the year 1825, a stage-coach might have been seen drawn up before the door of Mr. Richard Wale, baker, of this town, not far from where Christ Church now stands, where it had stopped to take up two passengers. 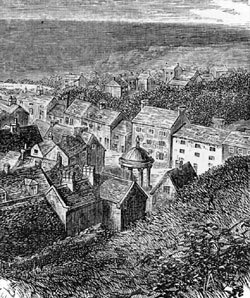 A large number of people stood gathered at the spot; for on this day Mountsorrel was for the first time to send forth one of her daughters, as the wife of a Christian Missionary, to labour, and as it proved, to die in a foreign land. When, therefore, the Rev. William Fidler led forth his young and beautiful bride, dressed in the plain, neat Methodistic fashion of those days, followed to the coach door by her father and mother, her sister Rebecca, and other members of the family, the greatest interest was manifested by the crowd around; and a stranger, looking down upon the tearful scene from the top of the coach, would have rightly guessed that a loving family was about to suffer the loss of one of its choicest members, and the little community one of its most valued citizens. The last hand-shakings were soon over, and the last words of parting soon spoken. “Goodbye, William, take good care of Anna,” was Mrs. Wale’s adieu to her son-in-law, while her husband added sorrowfully, and with deep emotion (and, as events proved, with true foresight),”I shall never see you more,” and the coach rolled away on the white, hard road in the direction of Leicester, and was soon lost to sight. Mrs. Rebecca Wakefield (née Brewin; 1844-1873) was Rebecca Brewin’s daughter and Anna Wale’s niece. She also married a missionary and, as the title suggests, served with her husband in East Africa. 3. Ebenezer Wesleyan Methodist Chapel was built on Old King Street in 1795 and pulled down for the Broadmead shopping centre after the Second World War. See Wesleyan and Independent Methodist Churches, Bristol for more information, including a photograph. 4. Built in 1817 it was also known as Old Market Street Chapel. Bristol Central Hall was eventually built on the site. 5. The Reverend Samuel P. Woolley; ordained 1806; died 1834.